Right click on the Redsn0w.exe and click on ‘Properties’. 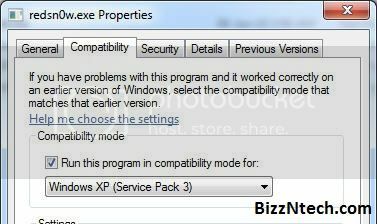 Click on the Compatibility tab and under the head ‘compatibility mode’ check the box and select ‘Run this program in compatibility mode for’ and choose Windows XP service pack 3. Click ‘Apply’ and then ‘OK’ to close the window and apply settings. Now, try redsn0w again to jailbreak, if it does not work then try Fix 2. Double click on redsn0w to launch it. Open task manager by holding the buttons Ctrl+Alt+Del. 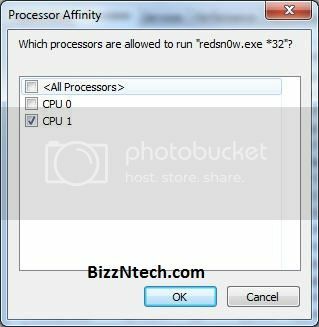 Find redsn0w.exe, right-click on it and select ‘Set Affinity’. Uncheck all the CPU and tick only CPU 1, then hit OK. This will force the process to run only on one core. Well, I’m not sure how this helps but it does help. I tried the compatibility fix and the above fix when I was jailbreaking iPhone 4 OS 4.3.1 on Windows 7. So, I’m sure it should work for you too.